The previous module identified the ways that Culture and Language form the foundation for group formation. As people form groups, they create a society, and within a society, humans work together and engage in adaptive strategies as a means of extracting their needs from the environment. Adaptive strategies are organized into livelihoods, which are tasks and duties that are carried out according to the positioning of the individual within their society. The system of exchange, production, distribution and consumption of resources taking place in a society and between societies is called an economy. Economics is the scientific study of economies, and Economic Anthropology is the comparative study of economic systems within a society. Unlike Classical Economics which relies on ‘laws’ and ‘principles’ to define economic behavior, economic anthropologists investigate the ways that social systems inform and are informed by economic activity. From an anthropological perspective, people do not engage in economic behavior as ‘rational actors’ as determined by classical economics. Economic behavior is informed by cultural values, symbolic action, ideologies and belief systems. Slovenian philosopher, Slavoj Zizek, offers an example of this in his book, First as Tragedy, then as Farse (2010), by highlighting the ways that companies such as the Starbucks Coffee Company incorporate charitable ‘feel-good’ elements in their marketing to persuade consumers to buy their products. By giving capitalism the ‘human face’ of charity Zizek argues, consumers make purchasing decisions motivated by guilt and conscience rather than a rational decision to maximize their outcome. In their book (and documentary) Freakonomics (2010), Stephen Dubner and Steven Levitt provide many different examples for the ways economic behavior is highly irrational as people make economic decisions based on racial bias, incentives, fear and superstition. So why do people rely on cultural values, ideas and beliefs when they engage in economic behavior? Because people interpret reality through their cultural lens, and this informs the way people interact with one another as they engage in different socio-economic strategies to extract, produce, distribute and consume resources that meet their needs. Until 10,000 years ago, all human groups engaged in foraging. Foragers extract wild game and uncultivated vegetable resources from the natural environment. Most foraging societies are organized into a group of bands that consist of fewer than 100 people. Foraging groups are generally mobile according to seasonal variations in the availability of game and vegetable resources. A number of foraging groups exist in the present, particularly in biodiverse areas that continue to support foraging modes of production or in areas that are unfavorable to food production (Lee and Daly 1999). 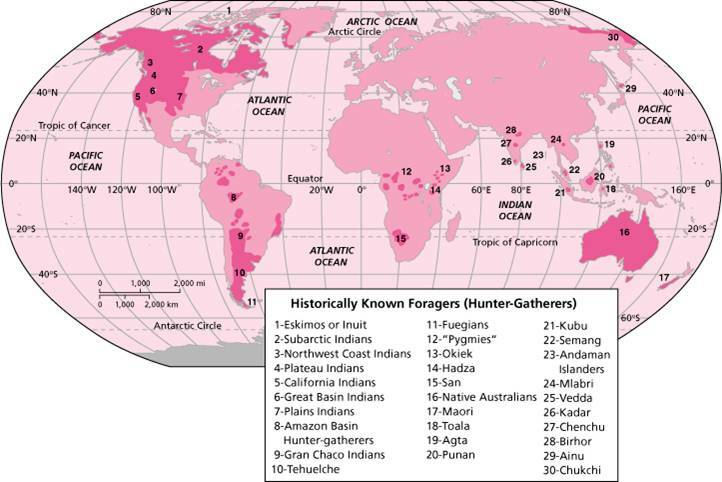 Yet, most contemporary foragers are at least partially connected to food production or external assistance (Kottak 2012). The pastoral mode of production relies on the domestication of animals such as cattle, sheep, goats, camels, yak, and reindeer. Pastoralists engage in a symbiotic relationship with animals; the pastoralists provides protection and resources to the herd, and the animals provide milk, meat and hides to the pastoralists. Most pastoralists supplement their diet by hunting, gathering, fishing, cultivating, or trading with their neighbors. Like foragers, pastoralism demands mobility according to seasonal variations in water and pasture for animals. Nomadism refers to themobility pattern when theentire group moves with the animals throughout the year, and Transhumance refers to the mobility pattern when only part of group moves with the herds, but most people stay in the home village. The documentary, Reindeer People (2012) details the day to day activities associated with herding reindeer. Cultivation is the intentional manipulation of the vegetative environment in order to maximize food productivity. Horticulture is cultivation that does not make intensive use of land, labor, capital, or machinery. Horticulturalists use simple tools, slash-and-burn techniques, and crop rotation to allow plots to lay fallow and recover from land-use. Archaeological evidence suggests that agriculture, which is intensified food production associated with large sedentary societies, originated in the Middle East and North Africa approximately 10,000 years ago. Cereal production became a staple food crop in agricultural areas where biodiversity was not sufficient to support large groups of people. Agriculture demands intensive use of land and technological inputs such as irrigation, terracing, fertilizer, transport, and additional labor energy harnessed from animals, exploited humans and fossil fuels. Agriculture is the keystone to the development of large civilizations, or chiefdoms, because sedentary settlements allowed for increased population density and social stratification, building constructions, the emergence of arts and crafts, and the need to develop laws and political systems to organize and regulate a large and diverse society. Approximately 5000 years ago, the first states began to form in Mesopotamia, followed by Egypt, the Indus Valley, northern China, southern Africa, Meso-America, the central Andes and the feudal system in Europe. 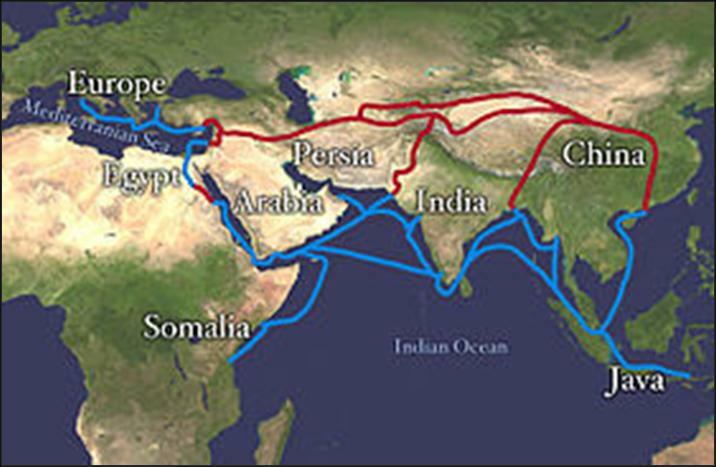 By the 15th century, large empires and civilizations in Asia, Europe and Africa were interconnected by a vast network of maritime and land transportation systems. While many civilizations collapsed as a result of widespread diseases and epidemics, environmental degradation and war, others continued to develop into states, ‘an autonomous political unit encompassing many communities within its territory, having a centralized government and the power to collect taxes, draft men for work or war, and decree and enforce laws’ (Carneiro 1970:733). States are characterized by highly defined social hierarchies that are organized according to created categories such as class, caste, ethnicity, gender, etc. (Weber 1922). As population pressures and competition among states increases the demand for additional resources, the state political unit must expand it territories in order to acquire more resources (Bodley 2007). As states expand and consume other territories to extract resources, they transition into an empire. We will explore states and empires further during the next module on Colonialism. Industrialization in the 19th century set forth a dramatically different mode of production by harnessing fossil-fuel energy as a means to extract, produce and distribute resources. Mechanization made possible through steam, coal and electric energy dramatically increased agricultural yields, and the manufacturing industry brought about a wide range of new food products as well as ‘luxury’ items. The industrialization of food production changed the human relationship to food resources and the natural environment . Foraging, Pastoral and Horticultural modes of production generally produce food for subsistence, meaning that food is produced and used for consumption and any surplus is trading for different resources produced by other subsistence producers. Industrialized food systems produce food for exchange to generate profit. Food becomes a market commodity, an object that is produced specifically for trade and converted into money which is then used to purchase other commodities. In subsistence production, the value of food is based on its use-value in meeting the nutritional requirements demanded by the body. In the industrialized system, the value of food is based on its exchange value in the market, which is subject to wild fluctuations according to market demand and political controls. The transition from subsistence production to commodity production changes the way food is produced, distributed and consumed. By the 20th century, the ‘Green Revolution’ aimed to harness technological solutions to food scarcity and pressures caused by exponential population growth. Researchers and scientists, such as Norman Borlaug, introduced genetically modified organisms (GMOs) to the industrial food system which aimed to increase agricultural yields and profits. The mechanization of animal production led to factory-farming techniques, such as the pig farm below, that aim to increase the production of animal commodities. Industrialization of food production also changed the ways humans extracted fisheries resources, such as the mass farming of fish. Despite the growing controversy surrounding GMO foods and factory farms, industrial food production undeniably increased food productivity, yet food shortages and famine conditions have also increased. Many economists argue that it is the commodification of food, not shortages, than generate famine conditions. Critics argue that unequal distribution in the food market generates extreme deficits in some areas and extreme surplus in others. In light os this, there is a growing demand to de-industrialize and decentralize food production. New movements initiated by the Transition Town Initiative in the United Kingdom, Joel Salatin in the United States, the Green Belt Movement in Kenya, and the Raw Milk Revolution throughout Europe and the United States rely on anthropological research to reintroduce small-scale and localized food production systems into the contemporary food economy. As we jump into the colonial era in the next section, we will delve deeper into the ways that socio-economic relationships between people and groups is informed by unequal power relationships that generate local, national and global disparities in the production and distribution of resources. The next section will address systems of unequal exchange established during the colonial period which set the stage for contemporary inequalities in the Modern World System and the Global Economy today. What do you think of Zizek’s theory? Does capitalism depend on charity? Is charity an oppressive apparatus that helps to maintain social inequality or is it directly linked to the evolution of empathy as a key to the survival of the human species? Be sure to use terms and concepts from the lesson in your response and to respond to other student posts. After discussion, continue to the Colonialism lesson.